Neuroepidemiology covers the foundations of neuroepidemiological research and the epidemiology of disorders primarily affecting the nervous system, as well as those originating outside the nervous system. The etiology of many important central nervous system disorders remains elusive. Even with diseases where the key risk determinants have been identified, better prevention and therapy is needed to reduce high incidence and mortality. Although evolving technologies for studying disease provide opportunities for such, it is essential for researchers and clinicians to understand how best to apply such technology in the context of carefully characterized patient populations. 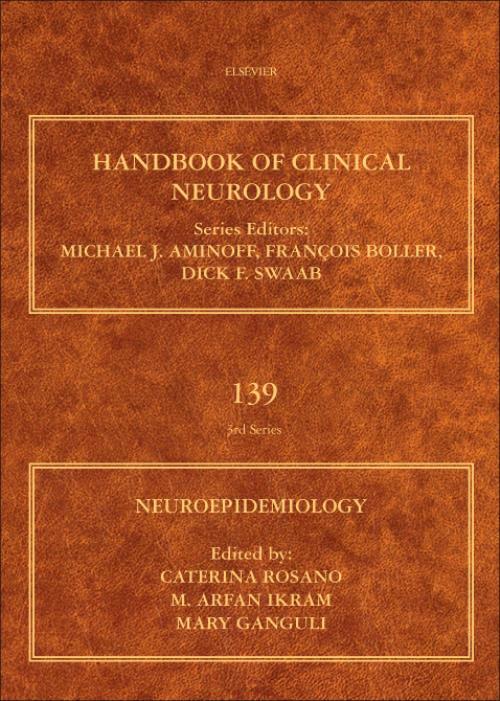 By paying special attention to methodological approaches, this volume prepares new investigators from a variety of disciplines to conduct epidemiological studies in order to discern the etiologic factors and underlying mechanisms that influence the onset, progression, and recurrence of CNS disorders and diseases. The book also provides current information on methodological approaches for clinical neurologists seeking to expand their knowledge in research. Dr. Rosano is Professor of Epidemiology at the University of Pittsburgh, Pittsburgh USA. Dr. Rosano's research integrates methods from the fields of neuroimaging, geriatric medicine, epidemiology and neuroscience to implement novel strategies for improving brain health and function. Her work to date has characterized and contrasted "normal? brain aging in older adults and "accelerated? brain aging in adults exposed to chronic diseases. Dr. Ikram is associate professor of Neuroepidemiology at the Erasmus University Medical Center in Rotterdam, the Netherlands. He is principal investigator of the Rotterdam Study and of the neurology core of the Rotterdam Study. His focus is on understanding the occurrence causes, pre-clinical phase and prognosis of neurological disease in late life, thereby focusing particularly on dementia and its subtypes, stroke, Parkinson's disease. Mary Ganguli, MD, MPH, FRCP(C), is Professor of Psychiatry, Neurology, and Epidemiology at the University of Pittsburgh (Pittsburgh, PA, USA). She specializes in geriatric psychiatry and psychiatric epidemiology. She has for the past 30 years conducted large-scale population studies in the USA and in India, focused on the epidemiology of cognitive impairment and dementia in older adults. She has published extensively on these topics, served on editorial boards and as associate editor for several journals, on work groups of the American Psychiatric Association and the American Academy of Neurology, and as grant reviewer for the National Institutes of Health and other funding agencies.